Spice & herb storage box with original hardware, Afghanistan, M. 20th C., 9" x 9 dia. 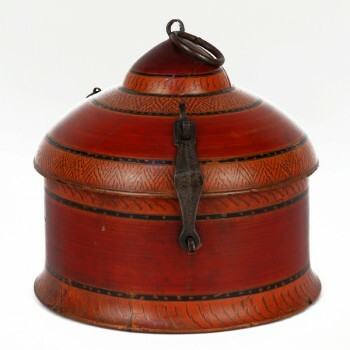 Polychrome painted wood spice box with original brass hinges and hardware. These traditional spice and herb storage boxes come in many sizes and a variety of colors and are used / found in India, Afghanistan and Pakistan. mid 20th century, 9" tall x 9.25" diameter. Fine condition.